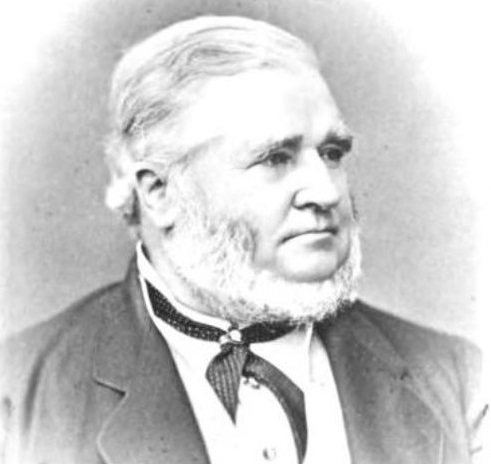 Milwaukee’s leading financier and railroad magnate in the mid-nineteenth century, Alexander Mitchell was born in Aberdeenshire, Scotland on October 18, 1817. Twenty-two years later, he immigrated to the U.S., settling in Chicago. That same year, Mitchell moved to Milwaukee to serve as secretary for a marine and fire insurance company owned by a fellow Scotsman, George Smith. Over the next few years, Mitchell and Smith circulated certificates of deposit backed by their own credit, in violation of their firm’s operating charter. This led the territorial legislature to seek revocation of that charter in 1846. Instead, Mitchell brokered a compromise in which the company reorganized as the Wisconsin Marine and Fire Insurance Bank. Under Mitchell’s supervision, the bank grew into the most powerful in the state. Mitchell obtained controlling interest in the WM&F Bank in 1854 and was elected as the first president of the Wisconsin Banker’s Association four years later. As such, he helped Milwaukee and Wisconsin’s financial institutions survive two fiscal crises that occurred around the time of the Civil War. Although Mitchell and his fellow bankers were accused of having deliberately saved themselves while others in the state suffered, in fact he devised the plan that effectively prevented financial collapse of both the city and the state during the early 1860s. The wealthiest man in Wisconsin according to the 1860 census, Mitchell was an ardent investor in railroads, the wheat industry, and other commercial ventures in Milwaukee. He sat on the Board of the Milwaukee Gas Light Company (est. 1852), backed the incorporation of the Milwaukee Iron Company in the late 1860s, founded Northwestern National Insurance in 1869, oversaw construction of the first pumping plant for city water in 1871, and helped finance the North Avenue Bridge in 1873. In addition to his passionate belief in Milwaukee’s economic potential, “Alexander the Great” was also known for monopolistic practices: by the start of the 1870s, he controlled nearly 100% of the grain elevators in the city. As president of both the Chicago, Milwaukee & St. Paul Railroad and the Chicago & Northwestern in the late 1860s, he directed railroad lines that may have managed more miles of tracks than any other combination in the world. The magnitude of his wealth combined with his business practices occasionally led to accusations of corruption. A Republican during the Civil War, Mitchell became a Democrat after 1865 and served in Congress from 1871 to 1875. In 1877, he declined the Democratic nomination for Governor, returning instead to his estate on Milwaukee’s Grand Avenue to focus upon local projects. His home was renowned for its grandeur and for a large horticultural conservatory. Mitchell made another architectural impact on the city with the Mitchell Building in downtown Milwaukee. This still existing structure, built in 1876, consolidated his ventures in railroads, the grain trade, and banking under one roof. It exemplified the impact Alexander Mitchell had had on the city at the time of his death during a trip to New York on April 19, 1887. ^ Dictionary of Wisconsin Biography (Madison, WI: The State Historical Society of Wisconsin, 1960), 256-257. ^ Bayrd Still, Milwaukee: History of a City (Madison, WI: The State Historical Society of Wisconsin, 1948), 58-59; Dictionary of Wisconsin Biography, 256-257. ^ Richard N. Current, The History of Wisconsin, vol. II, The Civil War Era, 1848-1873 (Madison, WI: The State Historical Society of Wisconsin, 1976), 105, 303-304. ^ Current, History of Wisconsin, vol. II, 121, 254; Gurda, Making of Milwaukee, 107, 111. ^ Still, Milwaukee, 246-247, 194; Gurda, Making of Milwaukee, 111; Still, Milwaukee, 248, 392. ^ Gurda, Making of Milwaukee, 109; Current, History of Wisconsin, vol. II, 444. ^ Current, History of Wisconsin, vol. II, 293; Dictionary of Wisconsin Biography, 256-257. ^ Gurda, Making of Milwaukee, 109-111; Dictionary of Wisconsin Biography, 256-257.